Alisa Titko is a bit hot and truly has no fucks to give…what’s not to love?? Get a load of Alisa Titko’s trigger rampage in Pravda. What a sweetheart and a cutie! Manchester is a city of “fat people” and “debauchery”, a columnist for Russia’s largest selling newspaper wrote in a homophobic article that described the sight of gay people as “disgusting”. 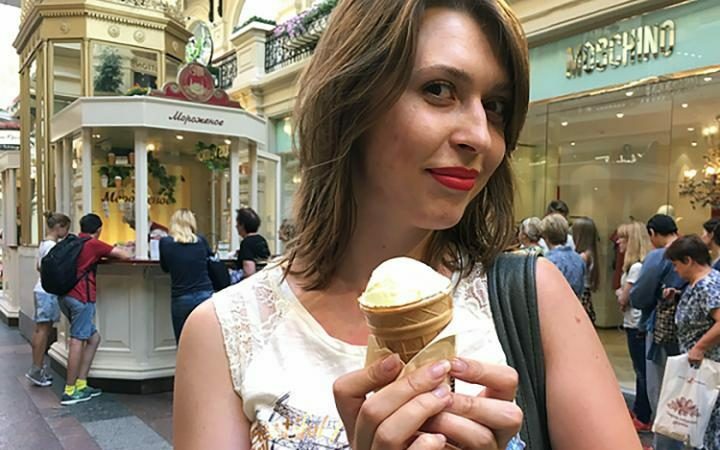 Alisa Titko, a writer for Komsomolskaya Pravda, also lauded Moscow in comparison, saying it’s “such a pleasure that there are no such gay streets” in the Russian capital. Having recently visited Manchester, she wrote: “It is true that there are many fat people in Manchester. “Local young women don’t mind when fat hangs down from their stomach and body – and does not fit into their jeans. “In Manchester there is a whole part of the city for gay people. Nobody told me about it, I have found it myself when I was walking around the town. She claimed the sight of gay people holding hands and kissing was “disgusting”. Have you heard some of the stuff that gets yelled at sporting events for chrissakes? Some of what I’ve heard shouted from the stands at any number of professional sporting venues would melt the paint off a wall. Just mix the innate imbecility of the typical American sports fan and a few pints of lite beer and you got yourself a toxic brew of immaturity and impulsiveness. As long as it remains a verbal barrage of inanities, professional sports teams usually don’t do much. Hell, as attendees, we’ve come to expect belligerence and the sheer unfiltered lunacy of the prototypical drunken sports fan in the next aisle. Generally, this kind of behavior is not called out or the focus of great concern by authorities, or anyone with a modicum of balls. And the majority of it is not racial in nature. But if amid your stream of crude obscenities you toss in a racial epithet, you must remember, it is the year 2017 and PC culture is rampant. Even in sports, especially Major League Baseball, which sees it as a problem, thanks to some lamentable whining on the part of the Baltimore Orioles’ very own Adam Jones following some rough verbal treatment he received at Boston’s Fenway Park. Jones complained Monday night that he heard the N-word several times, then had a fan throw peanuts toward him in the dugout. Boston Red Sox officials apologized and said that only one of 34 fans kicked out of the game was ejected for using foul language toward a player, and it wasn’t clear whether that was toward Jones. Boston police said the peanuts hit a nearby police officer and Fenway security kicked the man who threw them out before he could be identified by authorities. Commissioner Rob Manfred quickly condemned the incidents and said the treatment would not be tolerated inside any ballpark. On Wednesday night, Jones was ejected in the fifth inning after striking out swinging against the Red Sox. He was upset about a late strike call during the at-bat. Earlier this week, black players around the majors made it clear that what he experienced is an ongoing experience during road trips, varying by ballpark. Kemp said the vitriol in some parks has become a talking point among the dwindling fraternity of black players. According to the Institute for Diversity and Ethics in Sport, the number of African-American or African-Canadian players dipped from 62 each of the previous four years to just 58, or 7.7 percent, on MLB’s opening day active rosters. The NBA, Major League Baseball is not, and apparently the sports league is feeling the PC crunch due to its notoriously shrinking diversity. In order to alleviate the harsh image, step one is enacted: mind and behavior control of all park attendees. How long before we see security personnel at big league baseball games entrusted with the sole task of patrolling the stands while listening for any number of targeted racial slurs (a specific list of terms which will be defined according to MLB’s caretakers of human affairs) as grounds for ejection from the park? We have the technology, perhaps audio sensors which will narrow down the location in the stands where such reprehensible and horrid racial references originated (and an automatic camera to memorialize the offender’s face). Saudi nukes : Donald Trump's threats.